To properly open their 2010 dog training series, K9 University, provider of dog services, and dog behavioral training seminars, has announced the addition of Dean Calderon to their dog training series for 2010. Oklahoma City, OK, March 02, 2010 --(PR.com)-- K9 University recently announced that Dean Calderon, a leading world champion and contender in working dogs, and Schutzhund competitions, had accepted their invitation to join their team by opening the training season during what will most likely be the best training season in the company’s history. The dog training seminars and events season opens on April 30, 2010. Dean Calderon is one of the leading competition authorities in the world, starting his training career in 1977. He soon started winning competitions in 1979, having earned over 175 competition titles with multiple breeds. 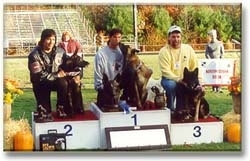 Dean served as the training director at America's most successful Schutzhund club of the 80’s, the “South County Schutzhund Club,” maintaining winning podium standing repeatedly. As statement to his expert skills, Dean has represented the United States as a USA team member eight times at the WUSV World Championship, and eight times at the IFR World Championship. The only trainer in the world to win World Team Championships in two breeds, as well as the only handler to win both the FCI World Championship and WUSV World Championship in the same year. Dean conducts seminars across the US, Europe and South America offering some of the most comprehensive service dog training programs available anywhere in the world. “This training seminar will give handlers and trainers alike a jump start to their training season, and ensure that competitors score higher during their next competition experience. Those attending will learn the necessary skills to take their work or service dog to the next level,” Soriano said. In addition to dog training seminars, K9 University also provides a host of first class products such as Personal Protection Dogs, Detection Services, Dog Bite Safety, dog training and extreme behavior curving. Through a versatile and adaptable approach to working with dogs and their owners, K9U has set the industry standard for achieving positive, sustainable results that can be used over and over again to bolster the behavioral learning process. K9U trainers are long-term career animal professionals and behaviorists with a combined 75 years of experience. About K9 University: (www.myk9u.com), K9 University is an educational institution focusing on dog training needs from the very basic to advanced and specialized training for problem dogs, dogs suffering with complex conditions, behavioral issues, and dogs that simply have bad habits. For more information visit the web site at www.myk9u.com, or call (405) 231-4335.